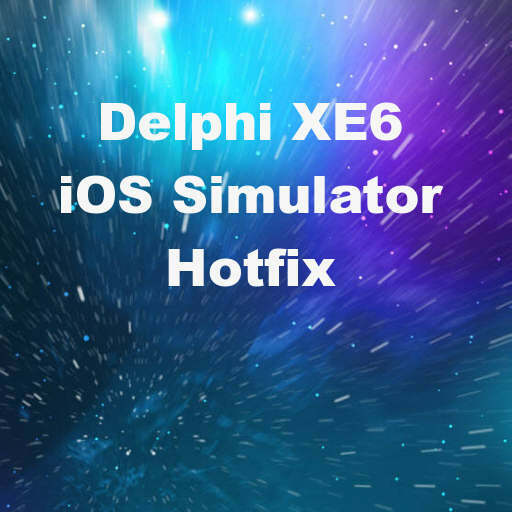 Hotfix for deploying iOS applications built with Delphi XE6 to the iOS 7.1 simulator With Delphi, C++Builder and RAD Studio XE6, we support deploying applications to iOS devices running both iOS 7 and iOS 8 out of the box. For deploying to the iOS Simulator with Delphi XE6, we currently support deploying to the iOS 7.1 simulator, and are actively working on enabling support for the iOS 8 simulator. If you checked the Mac preferences setting to automatically download and install new versions of your Mac applications in the background, then Xcode automatically updated to the newest version (6.0.1) on your Mac, assuming you previously had Xcode installed on your machine. Below are the steps to use the iOS 7.1 simulator while also being able to deploy to both iOS 7 and iOS 8 devices. Once you have applied this fix, you will be able to deploy to the iOS 7.1 simulator and devices running either iOS 7 or iOS 8. We will provide another update when iOS 8 simulator support is enabled. Install instructions: Step 1: Ensure you have the iOS 7.1 Simulator installed ------------------------------------------------------- a. Start Xcode 6.0.1 on your Mac (found in your Applications folder) b. Select the Xcode menu at the top and choose Preferences c. Select the Downloads tab and under Components, select iOS 7.1 Simulator and click the Download glyph to the right of it. This will install the iOS 7.1 Simulator if you don’t already have it on your system Step 2: Update PA Server using the provided files -------------------------------------------------- a. paserver and sim6x must be copied to the Mac computer. You can copy them to your users download directory (~/Downloads). b. Once these files are to the Mac computer, run the following commands via the Terminal. You can open the Terminal by going to Applications and selecting Utilities. Assuming the files are in your users download directory (~/Downloads).... c. sudo mv /Applications/PAServer\ 14.0.app/Contents/MacOS/paserver /Applications/PAServer\ 14.0.app/Contents/MacOS/paserver.bak sudo mv /Applications/PAServer\ 14.0.app/Contents/MacOS/sim51 /Applications/PAServer\ 14.0.app/Contents/MacOS/sim51.bak sudo mv /Applications/PAServer\ 14.0.app/Contents/MacOS/simulator-exec /Applications/PAServer\ 14.0.app/Contents/MacOS/simulator-exec.bak d. sudo cp ~/Downloads/sim6x /Applications/PAServer\ 14.0.app/Contents/MacOS sudo cp ~/Downloads/paserver /Applications/PAServer\ 14.0.app/Contents/MacOS sudo cp ~/Downloads/sim51 /Applications/PAServer\ 14.0.app/Contents/MacOS sudo cp ~/Downloads/simulator-exec /Applications/PAServer\ 14.0.app/Contents/MacOS e. sudo chown root /Applications/PAServer\ 14.0.app/Contents/MacOS/sim6x sudo chown root /Applications/PAServer\ 14.0.app/Contents/MacOS/paserver sudo chown root /Applications/PAServer\ 14.0.app/Contents/MacOS/sim51 sudo chown root /Applications/PAServer\ 14.0.app/Contents/MacOS/simulator-exec f. sudo chgrp wheel /Applications/PAServer\ 14.0.app/Contents/MacOS/sim6x sudo chgrp wheel /Applications/PAServer\ 14.0.app/Contents/MacOS/paserver sudo chgrp wheel /Applications/PAServer\ 14.0.app/Contents/MacOS/sim51 sudo chgrp wheel /Applications/PAServer\ 14.0.app/Contents/MacOS/simulator-exec g. sudo chmod 755 /Applications/PAServer\ 14.0.app/Contents/MacOS/sim6x sudo chmod 755 /Applications/PAServer\ 14.0.app/Contents/MacOS/paserver sudo chmod 755 /Applications/PAServer\ 14.0.app/Contents/MacOS/sim51 sudo chmod 755 /Applications/PAServer\ 14.0.app/Contents/MacOS/simulator-exec Step 3: Update iPhoneOS 8.0 SDK ------------------------------- a. On your Windows machine, copy iPhoneOS8.0.defaultsdkpaths to C:\Program Files (x86)\Embarcadero\Studio\14.0\bin b. If the iPhoneOS 8.0 SDK has been defined previously, you need to delete and re-create this SDK (see Tools | Options | SDK Manager) Copyright 2014, Embarcadero Technologies. All rights reserved. With Delphi, C++Builder and RAD Studio XE6, we support deploying applications to iOS devices running both iOS 7 and iOS 8 out of the box. For deploying to the iOS Simulator with Delphi XE6, we currently support deploying to the iOS 7.1 simulator, and are actively working on enabling support for the iOS 8 simulator. If you checked the Mac preferences setting to automatically download and install new versions of your Mac applications in the background, then Xcode automatically updated to the newest version (6.0.1) on your Mac, assuming you previously had Xcode installed on your machine. Below are the steps to use the iOS 7.1 simulator while also being able to deploy to both iOS 7 and iOS 8 devices. Once you have applied this fix, you will be able to deploy to the iOS 7.1 simulator and devices running either iOS 7 or iOS 8. We will provide another update when iOS 8 simulator support is enabled. a. paserver and sim6x must be copied to the Mac computer. You can copy them to your users download directory (~/Downloads). b. Once these files are to the Mac computer, run the following commands via the Terminal. You can open the Terminal by going to Applications and selecting Utilities. Copyright 2014, Embarcadero Technologies. All rights reserved. Head over and download the Delphi XE6 XCode 6.0 Hotfix for the IOS 7.1 Simulator from Embarcadero.